NEW YORK -- A fire at a New York City hospital building that’s under construction has been extinguished. 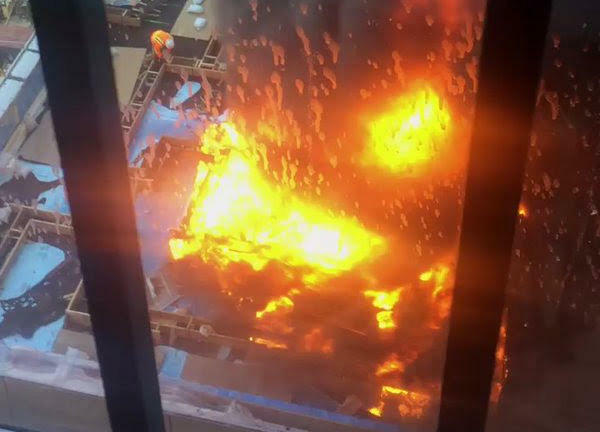 The Fire Department of New York says the fire at the NYU Langone Medical Center in Manhattan was placed under control Wednesday afternoon, less than an hour after it began. It says one civilian suffered minor injuries but did not require hospitalization. Joe Lhota, the medical center’s chief of staff, said the hospital continued normal operations and there were no evacuations, but some patients in a nearby building were moved away from the windows due to the smoke, CBS New York reports. FDNY Commissioner Daniel Nigro said very little smoke got into the hospital. “Very little smoke entered the building, the ventilation systems were shut down promptly by the hospital and it eliminated that as a problem,” Nigro said. Hospital spokesman Jim Mandler says the fire was at a building that’s scheduled to open in 2018. Thick black smoke and flames could be seen rising from the roof shortly after the fire erupted around noon.